Love this! She's so beautiful too. This is a beautiful illustration. I visited Angela's blog and you did a wonderful rendition. 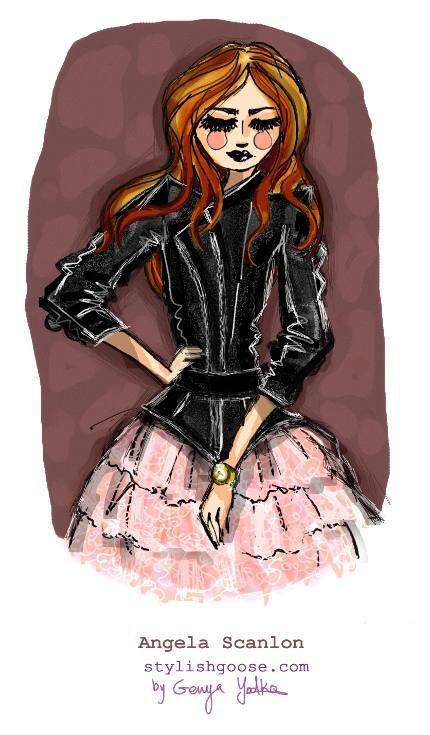 I am a fashion blogger and aspiring fashion illustrator. Right now, I do children's illustrations but am looking to branch out into fashion. Your stuff is very inspiring. I love your use of color, line, and form, with a touch of the whimsical. Brilliantly executed. Please visit my blogs and tell me what you think. Coveted: I am really flattered that you featured me in your mag! I love the idea of a Scottish Style magazine. Cheryl Lynn: Thank so much for your thoughtful and sweet comment. I am so glad to meet a fellow illustrator on blogsphere. I will definitely check out your blogs. Adore her style and she's awesome looking.